There is a lot of controversy in the field regarding orbs. There are many people who think that strange balls of light caught on still images or video are embodiments of spirits of dead people. Although I can see this maybe being a comfort to someone who is grieving over a recently deceased loved-one, I see no other positive reason for this belief. The truth of the matter is, 99.9% of all orb pictures can be explained as dust, insects, mold spores, or pollen. PIM believes calling orbs anything else is either ignorant, misleading, or both. The truth of the matter is, 99.9% of all orb pictures can be explained as dust, insects, mold spores, or pollen. There are microscopic things floating in the air all the time, we just can’t see them. Things like dead skin cells, animal dander, and textile particles are suspended in the air. When the flash from a camera catches these particles just right, the light reflects back out of focus and creates the ball of light that we see. 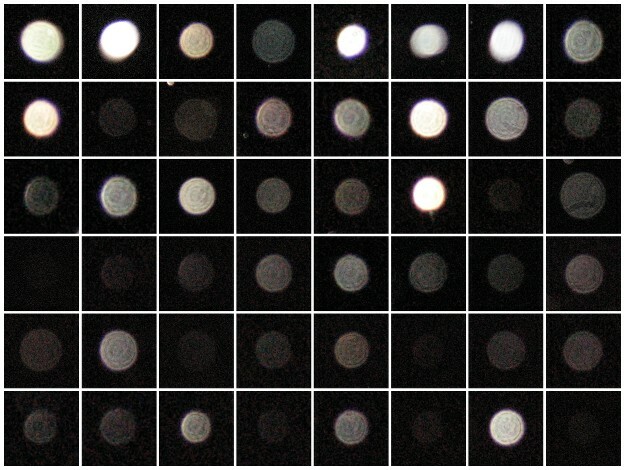 Below are examples of different types of orbs that were created by doing simple experiments to recreate what many people are capturing and calling orbs. Some have been borrowed from other websites as well. 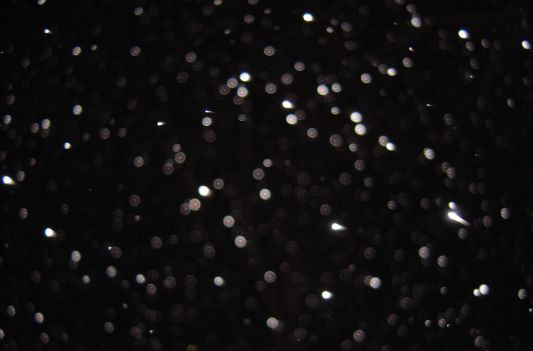 Examples of commonly captured dust particles but called “orbs”. Some insect orbs are very evidently insects but others are harder to pick out. 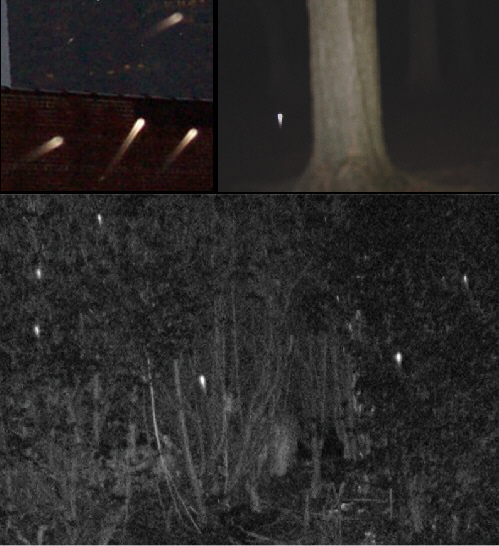 These orbs are usually brighter due to the higher density of insects compared to dust. Many times they are flying and thus a moving orb is created. Insects are small and fast and easily missed, especially in the dark. Don’t be fooled. 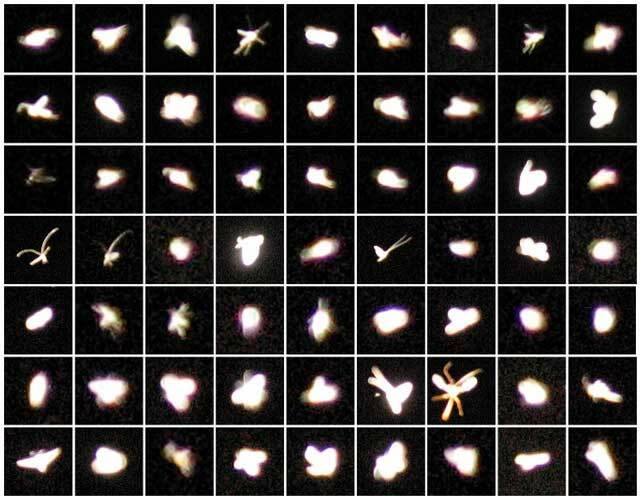 Cropped images of insects captured with a still camera. Some are obviously insects, but others are much harder to tell. Notice how the rain orbs look like they are moving upward. This is due to the refractive properties of water. Rain drops have most of their mass in the bottom due to gravity and as such when the light from the flash enters the rain drop it leaves via the path of least resistance, which is straight out the top. This makes it look like the orbs are moving upward. 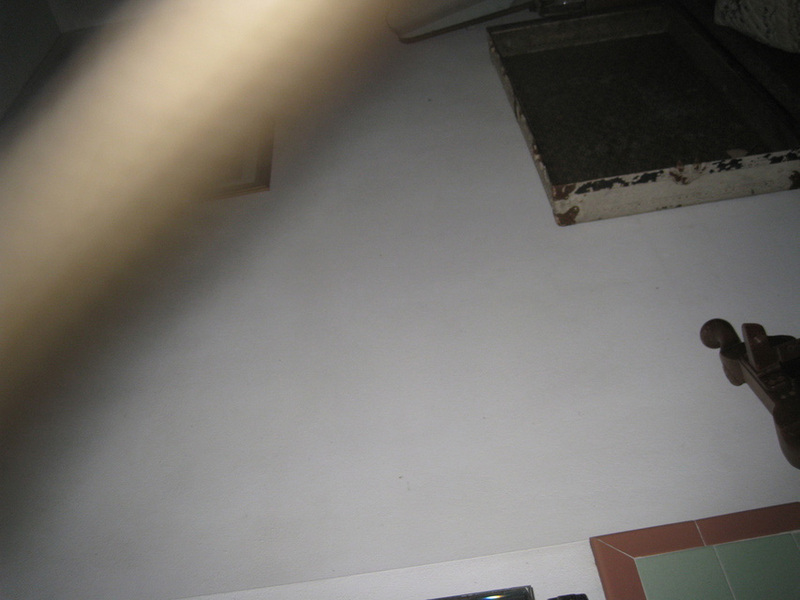 Several examples of pictures taken with flash of rain with a still camera. As can be seen, the reflected light looks like it is moving upward due to the shape of a falling rain drop. Snow orbs are more similar to insect orbs because they appear brighter due to the greater density that most have. However, you can get very different shapes from snow depending on how much water is in each flake. You have heard that there are no two snowflakes that are exactly the same right? Well think of how many different orb shapes snow could make. Example of snow captured with a still camera. The water content and intensity of the snow/wind when the picture is taken can affect how the snow “orb” could look. Some people will attribute the intention of a “spirit” based on the color of the orb captured. White or yellow equals nice spirits who are looking out for us and black or red orbs indicate evil or negative spirits or even demons that want to do us harm. The reality is that you can capture an orb of any shade of the rainbow that is dust. Think about it. How many different colored fabrics exist today? If you have a piece of clothing, a carpet, a drape, or bedding that color you can capture an orb the very same color with ease. The bottom line is the color of the orb doesn’t mean anything so please don’t assign meaning to something that is meaningless! 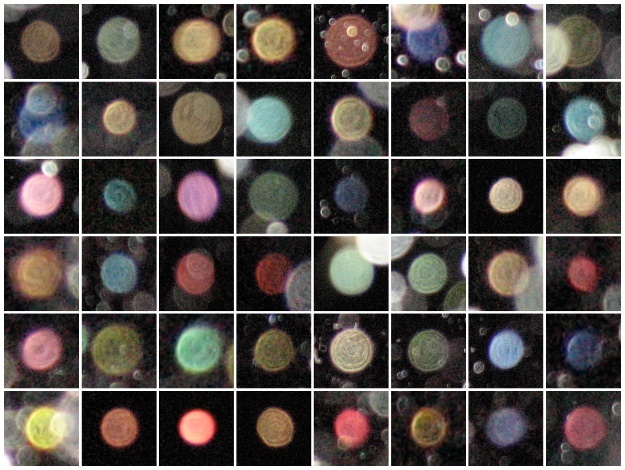 Examples of various “orbs” of numerous colors. The color that can be captured is only limited by the different colors fabrics at the location. 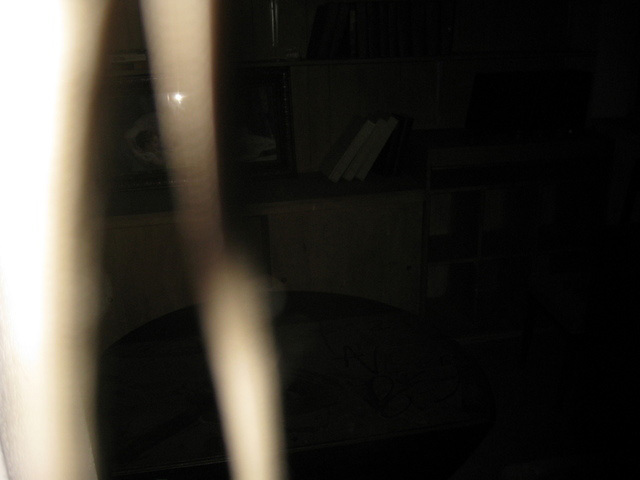 There are also things that are captured in pictures that are not orbs but look like ectoplasmic mists or vortices. These also have very common explanations. 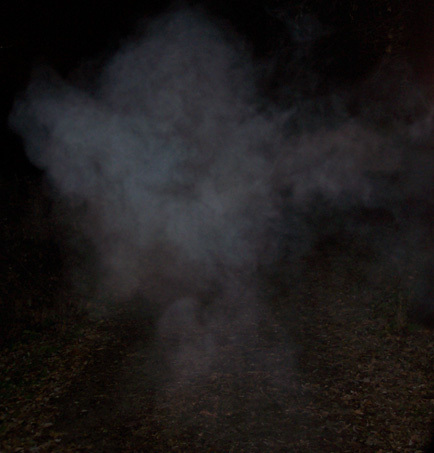 For ectoplasmic mists, it is usually exhaled breath, cigarette smoke, or water vapor. It doesn’t have to be below or near freezing in order to be able to see your breath. If the temperature drops quickly during a hot summer day you can easily see your breath when it is 60+ degrees outside. 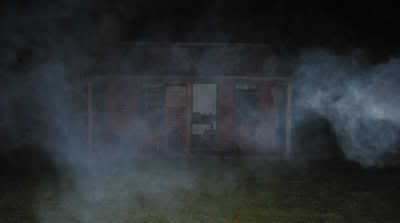 The same phenomena can cause mist to appear above the ground that is not able to be seen until illuminated with a light. Example of exhaled breath on a cold or very humid day. Often times you can’t see that your breath is visible until a bright light illuminates it. Cigarette or cigar smoke is generally whiter in appearance, but is also commonly mistaken for ectoplasmic mist. Example of cigarette smoke. This is also not visible in the dark until illuminated by a bright light. Example of a hair very close to the lens of the camera when the photo was taken. When it comes to vortices, or holes/portals in our reality that spirits move back and forth through, they are usually caused by a camera strap (below), hair (above), or even spider webs being caught in front of the lens of the camera. Example of a camera strap hanging in front of the lens when a picture was taken. Is there such a thing as a true orb? Yes! We are all made up of energy and we use lots of things that use energy and all these things can create orbs. Ever hear of ball lightning? Until scientists recreated it in the lab it was considered a paranormal event. Ball lightning is a great example of a natural orb. A natural orb should emit its own light and not need any external illumination to be visible. So if I see a ball of light with my eye did I just see a ghost? No! Just because you witness that doesn’t mean it is a ghost. As stated previously we are all made out of energy and for all you know that orb came from you. Without other evidence to back up paranormal claims, what you saw was just a ball of light, but that doesn’t make it a ghost. Now if you captured an EVP at the same time saying “Hey, that glowing green ball of light is me,” then we are getting somewhere. To PIM’s knowledge though, that has not happened yet.